The Academy Awards are upon us once again, and this year I vowed to watch all the Best Picture nominees before the ceremony. With the list of nominees extended to 10 for the second straight year, this was more difficult than I had anticipated. Fortunately, I had seen most of them already, so there were only three outstanding: Winter’s Bone, The Kids Are All Right, and 127 Hours. 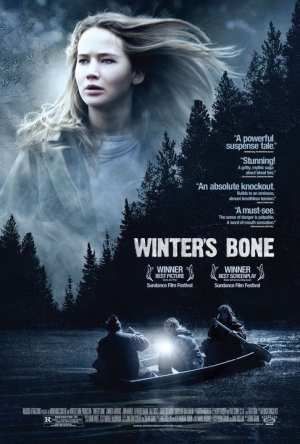 There’s usually one powerful independent film in the Best Picture mix and this year it’s Winter’s Bone, which has gotten rave reviews from just about every respectable critic out there. The story feels complex but it’s actually very simple. In an extremely poor rural area, a meth cooker has disappeared while out on bail and his daughter Ree Dolly (Jennifer Lawrence) is looking for him — she has to, because she has two young siblings and a catatonic mother, and their house is collateral for the bail. But the more Ree snoops around the family business, the more trouble she gets into. I suppose I would call it a gritty drama-thriller. A slow burn with moments of genuine suspense and horror. It’s the perfect example of a well-made indie film — low budget but compelling and well-acted — but I’m not sure I would put it in my top 10 list for the year (and hence Best Picture nominee). My problem with it is that it rarely gets out of first gear, and all the mumbling makes some of the conversations difficult to decipher. That said, I was intrigued even through all the slow bits, and it was a very bleak and harrowing depiction of rural meth country. Nevertheless, this film will likely make Jennifer Lawrence (nominated for Best Actress) a big star (she’s already nabbed the role of young Mystique in X-Men: First Class, and had an Esquire photo shoot that was rumoured to be the source of many ‘Winter’s Boners’). It was a knockout performance, subtle and utterly believable. Her co-star John Hawkes (also nominated, for Best Supporting Actor), was also very good. Overall, a very good film, an excellent indie film, but perhaps because of the lofty expectations I came away slightly disappointed. I had no idea what this film was about before I saw it and I didn’t really care — it just didn’t look like the type of film I was interested in. But it’s a Best Picture nominee so I forced myself, and came out pleasantly surprised. If there’s one movie I would compare The Kids Are All Right to (in terms of style and feel), it would have to be American Beauty. It’s one of those quirky dramas about suburban life in America, with genuine dramatic elements but also plenty of witty laughs and awkward moments. 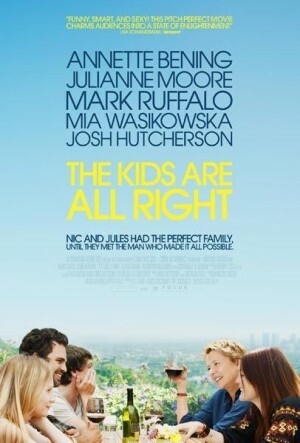 Without giving away too much, it’s about a lesbian couple (Annette Bening and Julianne Moore), their kids (Mia Wasikowska (Alice in Wonderland) and Josh Hutcherson) and the sperm donor (Mark Ruffalo). As usual, the less known the better. I would say this is a borderline deserving Best Picture nominee if we’re talking about a list of 10 (which is still pretty darn good in a relatively strong year). It had a fabulous script with terrific dialogue that’s amusing while remaining strangely realistic, plus killer performances by all involved. The standout for me was Mark Ruffalo (Best Supporting Actor nominee), who was just such a fantastic character. Even though I wouldn’t consider this a classic or a particularly memorable film, I still really enjoyed it. 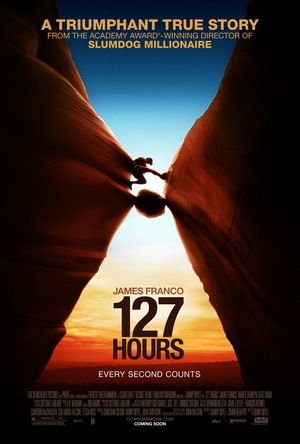 I was vary wary of watching 127 Hours, and it’s not just because of the gruesomeness most viewers knew they were about to encounter. It’s because it’s a story where it’s predominantly one guy in one place (think Buried, which a lot of people loathed) and you knew exactly what was going to happen at the end because it’s a true story. But my concerns were absolutely unfounded. 127 Hours is hands down one of the best films of 2010 and a deserving Best Picture nominee (even if there were just five instead of 10). Full credit to Danny Boyle (who won for Slumdog Millionaire a couple of years ago) for overcoming all the obstacles I thought this film would have and delivering such an emotionally involving, jubilant, triumphant motion picture. Just in case you’re one of the three people on earth who don’t know the story of Aron Ralston (James Franco), I won’t say much. I just wonder how I would have received the film had I not known about his amazing story, but the impressive thing is that I was still completely absorbed by the film despite that dreaded feeling of inevitability. I thought there was going to be a lot of extended flashback sequences, but to Boyle’s credit, there were surprisingly few. Some clever use of sound and sporadic dream sequences pushed the plot right along and kept it interesting and eventful for the entire 94 minute running time. Of course, you can’t talk about this film without mentioning the ‘masterful’ performance from James Franco (a strange word for the guy from Pineapple Express), who has become one of my favorite actors. Is there anyone in Hollywood more affable than him right now? Who else could have carried a film like this from start to finish? It’s a shame he’s going up against virtual lock Colin Firth this year. I loved this film and can’t believe I passed up two advanced screening opportunities last month. If I redo my Top 10 Films of 2010 this would probably be in the top 5.